I loved how different and fun this was! 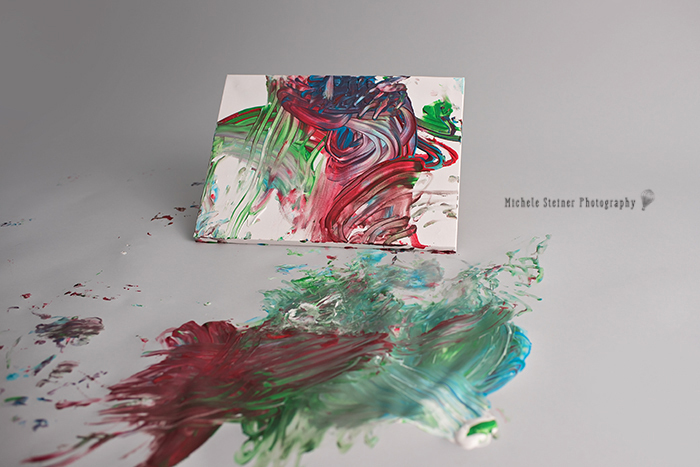 Both this sweethearts parents are very creative people and a paint smash was right up their alley. Her mother brought her in wearing a vintage green smocked dress that her grandmother had made for her own children. They chose a few colours - red, blue, green and white - usually i suggest 3 or 4 colours for the best impact. When introduced to the paint she went to town. Painted with such determination and charisma. No surprise that when it came to cleaning up in the bubble bath that she was full of smiles and splashes. I had so much fun capturing this paint smash. I loved her expressions! Check them out below. I provide the paint, white one piece and canvas, so all you need to worry about is bringing baby. The wonderful thing about this type of session is that you get to KEEP the canvas as a memorable keepsake. Hang it proudly! What is a milestone session?